Have you seen these pictures with the shaped bokeh? (blurred background light) Want to know how to do this? It’s super easy and a LOT of fun! Assemble your supplies and lens. Trace the front of the lens you will be using and mark an outer circle 2 inches wider. You could use the lens cap instead of the whole lens, but the lens cap may be slightly smaller than the outer edge of the lens. Just make sure the inner circle will cover the glass. You don’t want light creeping in on the sides. Cut a square in the middle of the inner circle. Again, mine is super messy. Do as I say, not as I do. Good. 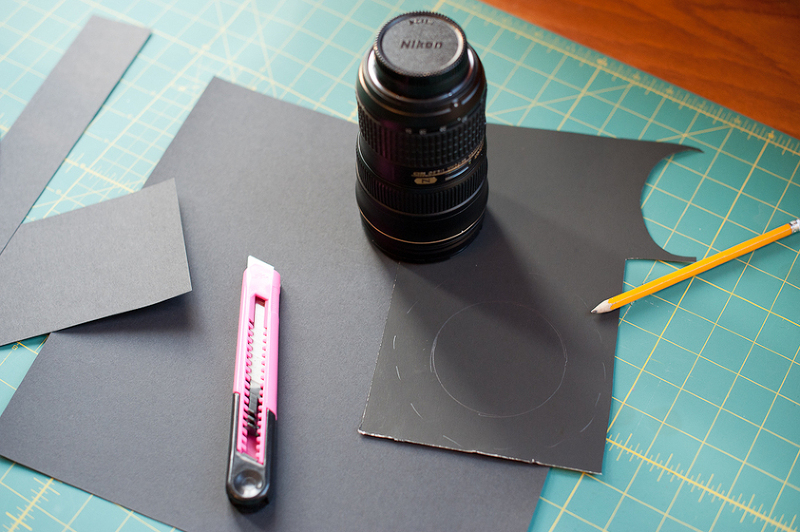 Cut a rectangle of paper that is the same width as the inner circle. This one is a bit too wide, but I will trim it after the next step. Cut the rectangle in half lengthwise. Trim the edges of the two rectangles so that they fit within the inner circle. These rectangles should only be wide enough to overlap two sides of the inside square. These rectangles will serve as guides to hold our fun-shaped filter. Staple or tape these two rectangles into place. One on top and one on bottom of the inner square. I would not recommend glue. I don’t want to get glue on my lens. Be careful with the staples. You don’t want to scrape your lens either. It would be a good idea to place a piece of tape over the backside of the staples to protect the lens from scratches. Cut out a rectangle of paper that will cover the hole in the middle and will slide in and out of the two rectangle holders you just stapled/taped on. FINALLY! The fun part is here! Cut or punch the shape of your choice in the middle of the rectangle that fits over the hole. If you are a scrapbooker, I need to borrow some paper punches. Thanks! See my sad little star that I cut out by hand? It works GREAT! Obviously, if you have some paper punches, this would be another great use for them. Now my handmade filter is ready to go over the lens! Get ready! This is super high tech. 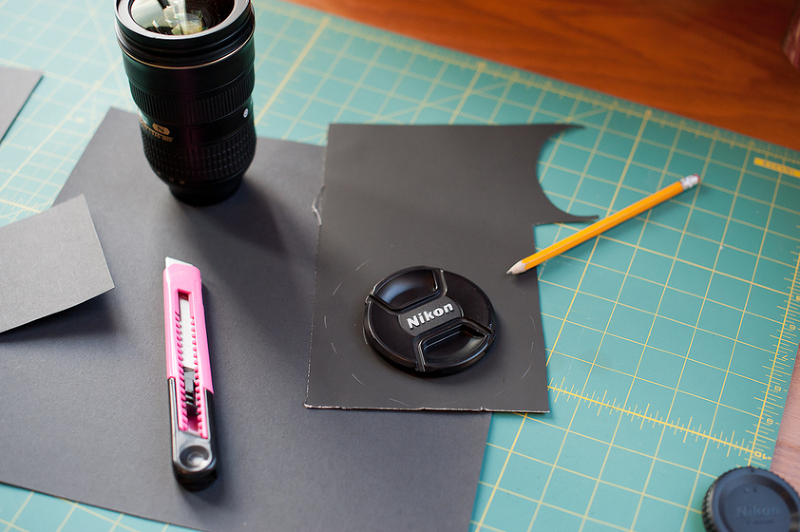 Use a rubber band to secure your cool home made photo filter to your lens. Don’t laugh. It works, baby. 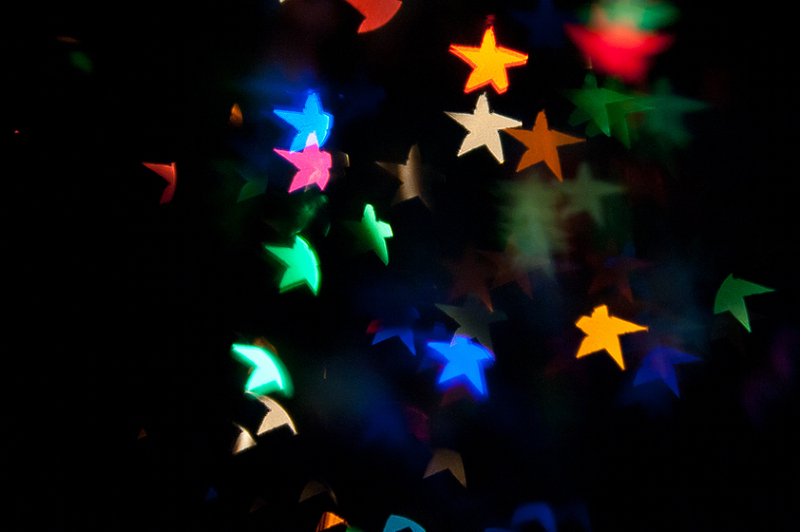 Now, you should refer to my previous post about fun with your Christmas lights to learn how to create bokeh. If you have read this, start snapping pictures! You will notice when you use your filter that your photos have a large vignette (faded to black edges). This is because you have reduced the light to only the center of the lens. I think it’s cool. Poor boy. He was the closest kid, so he is my example photo. Cute! See how the background lights (my Christmas tree) are now stars! FUN! Cute kid + starry lights = awesome! Here are some photos I took last year with different shaped filters. Go make your own and have some fun!